This is definitely Bach's most extraordinary work for the piano. Generations of composers learned the art of counterpoint by playing and studying this amazing collection of preludes and fugues. Counterpoint in simple words means the relationship between different voices which are played simultaneously. The "Well Tempered Clavier" is a work in two volumes. Each volume contains a prelude and fugue in every major a nd minor key, totaling 48 pairs. -	Beethoven used to practice The "Well Tempered Clavier" in all scales. -	Mozart encountered this book when he was 26 years old, and after that improved his counterpoint technique. -	Schumann recommended playing one preludes and fugues every day. -	Chopin's piano teacher taught his students from these books. What does "Well Tempered" mean? During the last 300 years, different methods were used to tune the keyboard instruments. Before the "well tempered" tuning method was applied, some scales were not practical to use. This means that if you tried to play a melody on one of those scales (for example C sharp major) the sound produced would be out of tune. The "Well Tempered" tuning method made it possible to play on all 24 scales (12 majors and 12 minors), so Bach wrote preludes and fugues for each one of them. Simply, it means a keyboard. There were various kinds of keyboard instruments during Bach's life- organ, harpsichord, clavichord and the pianoforte (pianoforte is another name for a piano). We don't know for which exact instrument the "Well Tempered Clavier" was written, but the compositions can be played on many kinds of keyboards including the ones mentioned above. Today, the most popular keyboard instrument is the piano, so it is mostly performed by pianists. A prelude is a short piece of music, which usually acts as an introduction to the main piece. Most preludes in the "Well Tempered Clavier" are not as complicated as the fugues; they contain a small rhythmic and melodic motive, which recurs through the whole piece. For example the most famous first prelude in C major consists of an ascending arpeggio that is repeated over and over - slightly different each time. This prelude is the basis of the popular and beautiful aria - "Ave Maria" by Charles Gounod. In The "Well Tempered Clavier" each prelude is followed by a fugue. A fugue is a composition written for two or more voices. It contains a musical subject introduced at the beginning and imitated by the other voices. This subject frequently recurs during the fugue, each time in a different voice and a different variation. Most of the fugues contain three or four voices though you can find fugues with even more. The fugues usually require at least 4 -5 years of piano studying, since they involve a high level of coordination between the hands, a rich harmony and a high level of counterpoint. However, as said before, the preludes are easier - for example the "Prelude in C major" a beautiful piece - which every beginner must learn to play In general Bach's prelude are not as complicated as his fugues. I would like to add a personal view about the "Well Tempered Clavier". As a composer and arranger I write music for orchestras and Big Bands. Studying pieces from this amazing work by Bach has helped me to (differentiate the layers of the music, making it easier for me to compose music for the various instruments in the orchestra. I don't compose in Bach's style, but the "Well Tempered Clavier" immensely improved my ability to write for various musical instruments. We have placed both "Well Tempered Clavier" books on our site. You are welcome to download the music sheet of preludes and fugues, and listen to them by clicking the audio file. Click here if you haven't signed to Piano Playground, our free E-zine yet make sure you do that in order to get the username and password codes for the free piano sheets we provide here under. If you experience problems reading these piano notes you should definately check out the Rocket Piano Ultimate Learning kit. 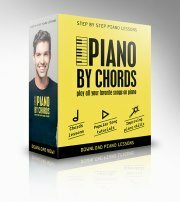 Rocket Piano provide an amazingly handy and effecive piano course on various issues such as reading piano notes, playing piano by chords, piano technique and more.